The designations employed and the presentation of material in this publication do not imply the expression of any opinion whatsoever on the part of the Food and Agriculture Organization of the United Nations concerning the legal status of any country, territory, city or area or of its authorities, or concerning the delimitation of its frontiers or boundaries. All rights reserved. No part of this publication may be reproduced, stored in a retrieval system, or transmitted in any form or by any means, electronic, mechanical, photocopying or otherwise, without the prior permission of the copyright owner. Applications for such permission, with a statement of the purpose and extent of the reproduction, should be addressed to the Director, Information Division, Food and Agriculture Organization of the United Nations, Viale delle Terme di Caracalla, 00100 Rome, Italy. Hyperlinks to non-FAO Internet sites do not imply any official endorsement of or responsibility for the opinions, ideas, data or products presented at these locations, or guarantee the validity of the information provided. The sole purpose of links to non-FAO sites is to indicate further information available on related topics. This electronic document has been scanned using optical character recognition (OCR) software. FAO declines all responsibility for any discrepancies that may exist between the present document and its original printed version. 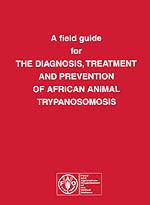 This new edition of the well-known field guide on African animal trypanosomosis adheres as much as possible to the original style and, particularly, to the intention of the author of the first edition in that it is essentially meant to be a guide for field control personnel. Its scope has been extended somewhat beyond that of the African continent, as trypanosomes of African origin have spread to the Americas as well as to Asia, and even to Europe, but the main emphasis remains on Africa. More attention is also given to methods of control of the disease other than those using chemotherapy and chemoprophylaxis, as it is being realized that drugs alone are not a sustainable answer, and have to be integrated into a multidisciplinary and flexible approach to control of the disease. For instance, the first edition did not touch upon the important subject of control of trypanosomosis through vector control. Molecular methods have considerably changed virtually all aspects of our knowledge of African trypanosomosis, particularly in the fields of taxonomy, immunology and diagnosis. Nevertheless, this progress has not (yet) had much impact on the situation in the field, as will be evident from this second edition. I am very grateful to Jan Slingenbergh and Brian Hursey of the Animal Health Service of FAO, Ron Dwinger of the Joint FAO/IAEA Division for Animal Health and Production, and Peter van den Bossche of the Regional Tsetse and Trypanosomosis Control Project in Harare, for all the time they spent in reading the manuscript and for their many valuable corrections, comments and suggestions. Thanks are due to Joachim Otte of the Animal Health Service of FAO for compiling the appendix on considerations of sample size and also to Giorgio Beccaloni of the same service for his skilful rendering of several of the original drawings and for creating new ones.